helped due to her efforts, many of which still enjoy happy lives with loving families today. We wish her well in her new endeavors as we continue the mission of Faery Tails in this new decade. “According to legend, two young children out tending the family’s cattle on the king’s land found a pair of puppies, which they thought were little foxes. When the children took the puppies home, they were told by the men folk that the little dogs were a gift from the fairies. The “wee folk” of Welsh legend used the small dogs to either pull their carriages or as fairy steeds. As the foxlike puppies grew, they learned to help their human companions watch over the cattle, a task that was to be the duty of their Corgi descendants for many centuries thereafter. Should anyone doubt the truth of the legend, the present-day Welsh Corgi still bears the marks over his shoulders of the little saddle used by his fairy riders.” From The New Complete Pembroke Welsh Corgi by Deborah S. Harper. Faery comes from an ancient spelling of the word Fairy and you’ve now read of the legend concerning the Faery Steeds of old. 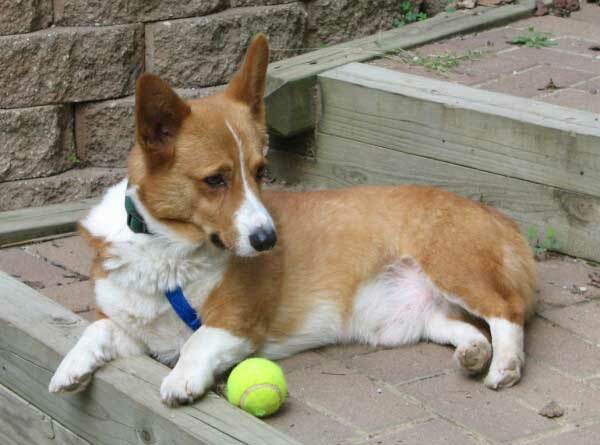 The Pembroke Welsh Corgi is often the breed that comes to mind when someone refers to a Corgi. We rescue Cardigans as well as Pembrokes and we wanted to emphasize that in our name and therefore changed the traditional Tales intoTails. We wish for faery tale endings and happily ever after lives for all of our dogs. Hence our name evolved to be Faery Tails Corgi Rescue of St. Louis Inc.